KENNEWICK, WA – Join the Americans on Saturday, February 9th as the team hosts the 14th annual Fred Meyer Breast Cancer Awareness Night presented by Sunwest Sportswear, 98.3 the Key, KNDU, and SWX. The Americans will take on the Victoria Royals with fundraising activities benefiting Tri-City Cancer Center Foundation. As always, the ice will be painted pink and the team will wear special Breast Cancer Awareness jerseys. Prior to the start of the game there will be a special ceremonial puck drop with breast cancer survivor Tammy Yaremko, the mother of Americans captain Nolan Yaremko. Luminaries can be purchased from the Warrior Sisterhood table behind section C on Friday 2/8 for a $5 donation benefiting Warrior Sisterhood. Fans can customize the luminaries with a personal message. They will be lit and displayed during Saturday’s pre-game ceremony. 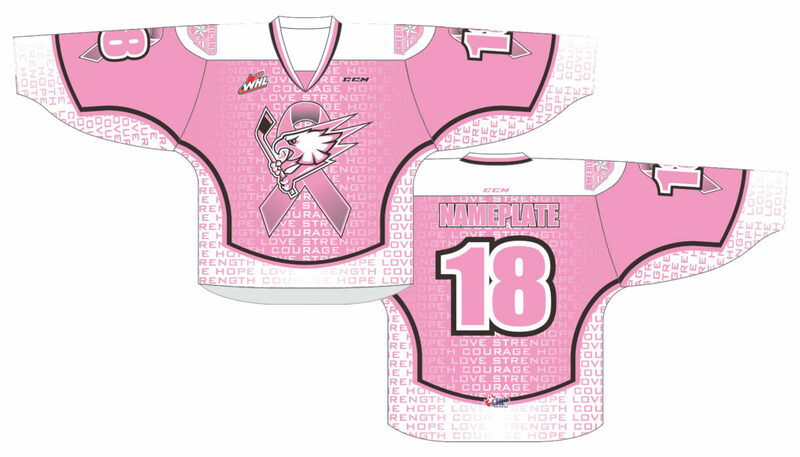 The Breast Cancer Awareness jersey auction will take place in-arena. All player jerseys, both game-worn and non-game worn, will be sold inside the Toyota Center behind Section R the night of the event. The auction will start when doors open to the Toyota Center at 6:00pm and will close at the drop of the puck to begin the 3rd period. The minimum bid is $250, with a Buy It Now option of $800. All proceeds benefit the Tri-Cities Cancer Center Foundation. Baseball t-shirts will be available to purchase that night for a suggested donation of $20 behind Section X, courtesy of SunWest Sportswear. While supplies last fans will receive a water bottle from Tri-City Cancer Center at the door. There will also be a large silent auction on the Toyota Center concourse behind Section J featuring gift baskets, Americans memorabilia, autographed pink Breast Cancer Awareness Night pucks, and more. Get your tickets now for a night of hope, fun, and entertainment at the 14th annual Fred Meyer Breast Cancer Awareness Night on Saturday, Feb. 9th at the Toyota Center! Buy here. The Tri-Cities Cancer Center began as a dream for a place within our region not only to treat cancer, but also to care for those impacted by it. United in a common goal, local hospitals, individuals, civic groups, and businesses came together to make that dream a reality. The Center, a joint venture of Lourdes Health Network, Trios Health, and Kadlec Regional Medical Center, opened its doors in 1994 as a freestanding non-profit cancer treatment facility. Since then, the Tri-Cities Cancer Center has become a community resource for cancer treatment, support, education, and information. It is also a place where hope is intertwined with compassion, where dedicated professionals work alongside devoted volunteers, and services expand each year, due to the generous support of our community. It is a place where we stand together against a disease that affects us all. The Foundation was established to support programs and services the Cancer Center provides to patients and their families at no cost. These services, which include our Nurse Navigators, Chaplains, and the Patient Financial Counselor help patients and their families through their cancer journey and provide financial and spiritual support in facing this difficult disease. The Foundation also supports community programs, like no-cost screenings, cancer-education presentations, and classes in our Wellness Center. We also house the region’s most comprehensive cancer education library, the Ralph R. Peterson Library, dedicated in 2010. The Cancer Center was built in 1994 by generous donations from our community. Thank you for continuing this legacy as we fight a disease that affects us all.